31 January – although our camera has been on and off today, the change in the position in some of the stones indicates that at least one of the birds has been in the box before 8:00 this morning. There were no further ventures into the box recorded today. 30 January – the male makes a brief check into the box at 6:35 before moving to the ledge calling. The female can also heard at this time. The male is in the box at 10:05 but returns to the ledge calling a few moments later. Although there were no further ventures into the box today, during the day both the male and the female were noted on crosses of the Cathedral spire with the male also on the platform ledge. You may have noticed a slight change in the angle of the camera as we try to rectify our problems by replacing one of the units. 29 January – the male arrives calling at 7:25 with the female heard on the platform. After a few minutes the male continues to call but the female cannot be heard. He moves to where the main scrape is, still calling. His actions seem to indicate that the female is still on the ledge but cannot be seen. He is till calling at 7:45 and the female enters the box also calling. She replaces him on the scrape and he goes onto the ledge. She is now chipping softly in the box whilst he has gone quiet. After a few minutes, she leaves the box. There were no ventures into the box until the female returns calling at 15:30 moving to the ledge a few minutes later and the male walking into the box briefly, then returning to the ledge. 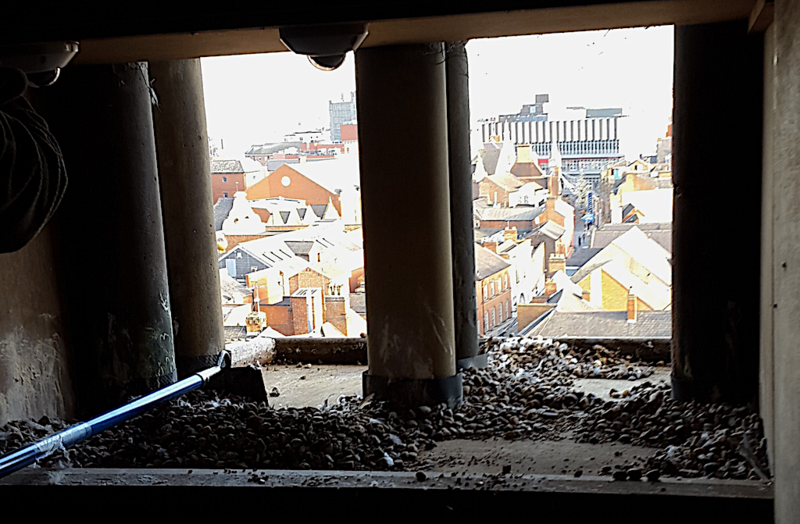 28 January – there were no ventures into the box today but during the day both the male and the female were noted on crosses of the Cathedral spire with the male also on the platform ledge. 27 January – there were no ventures into the box today. 26 January – the female arrives in the box at 10:20 calling but leaves after 5 minutes. She returns an hour later calling and moves a few stones around and makes a small scrape. The male makes an entrance at 13:45 calling initially. After a few minutes he is replaced by the female and he retreats to the platform. She leaves after a few minutes. 26 January – Video: the female replaces the male in the box. 25 January – the male makes a brief visit to the box at 7:55. There were no further ventures into the box today. 24 January – the female arrives at 8:50 and moves a few stones around leaving 10 minutes later. There were no further ventures into the box today. 23 January – there are a few feathers being blown in at 10:15 suggesting prey (Feral Pigeon) being plucked on the platform. There were no ventures into the box today. 22 January – the male arrives at 7:40 calling. The female quickly replaces him and there is posturing and calling. They leave after 5 minutes. The male is back at 9:00 but leaves a few minutes later. He returns calling at 13:25 but 5 minutes later is displaced by the female that moves a few stones and does a bit of scraping, leaving after 10 minutes. She is back again at 15:35 but stays just a few minutes. 21 January – the male comes into the box calling at 7:55. The female can also be heard so is presumably on the ledge. He walks out after 10 minutes. The female arrives with an item of prey at 8:45 and tries to stash it in the corner. However, she leaves with it a few minutes later. As she leaves the male arrives calling. He leaves at 8:55. The female is back briefly at 9:25. Both birds are back at 12:10 when there is posturing and calling. They have departed 10 minutes later. The female returns at 14:10. She moves a few stones and generates a scrape before leaving after 10 minutes. She is back at 16:15 again moving stones and scraping leaving after 10 minutes. 20 January – there were no ventures into the box today. 19 January – the male makes a brief visit to the box at 7:35 then returns calling 5 minutes later, leaving after a further 5 minutes. He is back at 8:00 and runs in calling. The female arrives a few minutes later and he moves to the platform. There is calling and posturing and they both leave the box after 5 minutes. He returns at 8:15 calling quietly moving to the ledge after 5 minutes. He is back calling at 9:15 and is soon joined by the female. He moves to the platform and there is calling and posturing. She moves to the platform after a few minutes. Both birds are back in the box at 12:25. There is posturing and calling and the male leaves after a few minutes and is quickly followed by the female. The male returns at 14:10 and leaves after 5 minutes. Both birds are back at 14:20 the male on the ledge and the female in the box but leaves after a few moments. 18 January – from the amount of feathers reaching the back of the box at 6:55, it is obvious one of the pair has an item of prey and is plucking it on the ledge. At 14:25, the female enters the box and retrieves an item of stashed prey from the back of the box – somehow I missed this being stashed! She returns to the box calling and posturing 20 minutes later. The male is heard on the platform. She leaves the box after a few minutes. 17 January – the male makes a visit to the box at 8:20 and stands by what appears to be the most regular scrape. After 10 minutes he moves to the platform and out of sight 5 minutes later. The female visits at 8:45 and can be seen trying to ‘eat’ a small stone. She keeps dropping it and picking it up, eventually swallowing it then finds another. She moves to the ledge a few minutes later. There is no further box activity today. 17 January – Video: the female follows a stone she has dropped in the box and makes several attempts to swallow it and other stones. 16 January – the male goes into the box at 7:50 where he is calling and leaves after 15 minutes. He returns at 9:35 and the female can be heard from the ledge. He leaves 5 minutes later. 15 January – there were no ventures into the box today. 14 January – there were no ventures into the box today. 13 January – the male is followed by the female into the box at 13:50. He moves to the ledge and there is calling between the pair. The female moves a few stones and makes a small scrape before leaving the box. The male takes a quick look into the box at 14:00. 12 January – the female comes into the box at 9:40 and spends the next 5 minutes moving stones around. The male comes into the box at 11:15 calling but walks onto the platform after a few minutes. The female is back at 14:00 and spends 5 minutes making a scrape and moving stones before walking to the platform. 11 January – the male comes into the box at 9:05 leaving a few minutes later. The female arrives at 9:45 and proceeds to generate a scrape in the new stones. She obviously hasn’t been put off. She leaves after 5 minutes. Both birds are on the platform during the afternoon as I can see the shadows and tail-tips on the edge of the picture. 10 January – the change in the stones has not affected the pair. From the limited view from the EggCam, the female brought in a prey item (Feral Pigeon) at 8:45. The male visited the back of the box at 10:20 and 10:40 looking for food. 9 January – there is no activity on the platform this morning but during the Peregrine Watch Day both adults were noted frequently on the spire crosses heading off southwest together at one point and north later in the morning. It would be great to know where they were going. During the period the birds were away, we took the opportunity to clean the box and replace it with new, fresh stones. The cameras were switched off during the process at 11:00 and unfortunately we are having issues rebooting one of the cameras. You may recall, this happened last year and took a little while to resolve. Please bear with us whilst we look into the situation. 9 January – Photo: Work to replace the old stones with clean ones. 8 January – the male and female arrive together at 6:25 calling. The male leaves at 6:50, the female at 7:10. The male returns at 7:30 remaining until 7:50. He is back an hour later but only remains for 10 minutes. The female flies in at 12:05 staying for 20 minutes. The male is back at 13:10 remaining for just 10 minutes. There is no further action today. 7 January – the male and female arrive together at 5:55 calling but the male leaves quickly. He is back at 7:20 and the female goes into the box. He flies off 5 minutes later and she returns to the ledge. He flies in again at 7:40 and both birds go into the box for a few moments. He flies off after 5 minutes and she returns to the ledge. He is back at 9:00 and goes into the box. The female displaces him and he moves to the ledge flying off after a few minutes. The female moves back to the ledge, leaving at 9:25. The male is back at 9:40 but leaves after 15 minutes. He flies in at 10:15 going into the box calling but leaves after a few minutes returning an hour later. He takes a short flight at 11:50. He flies off at 12:05 but returns with the female a few minutes later. He goes into the box and there is calling between the pair. They soon swap places and after 5 minutes, the female settles on the opposite ledge. The male leaves at 12:30 and the female 30 minutes later with the male landing a few minutes later. He takes a short flight at 13:15 then leaves between 13:50 and 14:25. There is another short flight at 14:50 and again at 15:00 and leaves a few minutes later. The female is back at 15:30 remaining until 16:15. 6 January – the male arrives at 6:00 and makes a short, probably hunting, flight an hour later. At 7:35 he picks up some scraps of previous meals on the platform. He makes another short flight at 8:25 and then walks into the box calling before flying off at 8:35. He is back at 9:30 leaving after 10 minutes. He is back briefly at 10:30 and 5 minutes later returns to pick at more scraps on the platform before settling on the ledge. He is off again at 11:10 and is back at 13:55 but only stays for 5 minutes. At 14:40 he flies in and runs into the box calling. After 5 minutes he moves to the ledge, remaining until 15:40. There is no further activity today. 5 January – the male arrives at 5:50 and picks at the scraps of previous prey items before settling on the ledge. He goes into the box on the arrival of the female at 8:45. She picks up some remnants to eat and he flies off. She sits on the ledge 15 minutes later, then flies off to be replaced by the male. He has picks at some remnants of the Golden Plover at 10:05, then settles back on the ledge. He takes a short flight at 11:10 and leaves at 11:20. The female comes in calling at 11:30 but is pre-occupied with something overhead and takes flight. She returns after a few minutes but again leaves almost immediately. The male returns calling at 12:20. He flies off at 12:55 but is back a few minutes later and goes into the box where he calls occasionally before returning to the ledge. He takes a short flight at 13:10 and goes into the box as the female arrives. She soon replaces him and he flies off. The female moves to the platform and snacks on the remnants of left-overs, then settles on the ledge preening. She takes flight at 13:35 but returns with a large Feral Pigeon a few minutes later just after the male lands. He leaves quickly and she plucks and feeds on the prey. The male is back at 13:55 and she immediately mantles her meal and calls loudly. He walks towards her but she flicks out her wing and he flies off and she continues eating. He is back 5 minutes later but she refuses any of her meal. She hunches over it and calls at him and he soon gives up. Unperturbed, he tries again at 14:15 but the female sees him flying in and prevents him from landing. She then leaves with her prey, presumably to somewhere she can eat in peace! The male is back at 15:30 and from the size of the crop, looks as if he has fed well. Indeed he is carrying a small amount of meat in his left foot which he consumes. He is displaced by the female who is also showing a very heavy crop. She remains on the ledge until 16:25. 3 January – the male arrives at 7:35 he flies off returning immediately with the female on his tail. He goes into the box and there is calling. She soon replaces him in the box and he flies off. She picks at the remnants then sits on the ledge, flying off at 9:35. The male is back at 11:05 and has another pick at the scraps before moving to the ledge and leaving at 11:25. He is back 10 minutes later with the female. She goes into the box and 5 minutes later he leaves as she sits on the ledge, flying off at 12:15. She is back at 13:25 calling but only stays a few moments, flying off whilst calling. The male comes in at 14:50 but leaves a few minutes later. He is back at 15:50 taking a short flight soon after then settles on the ledge finally leaving at 16:20. 2 January – the male arrives at 7:45, leaving a few moments later. The female arrives with a large Feral Pigeon at 10:00 and proceeds to pluck and eat it. In the space of 15 minutes, the male flies in twice but leaves immediately, fended off by the female. He tries again at 10:40 but the female jumps at him and he flies off. Five minutes later she leaves with the remains of her meal. There is no further activity today. 1 January – the male arrives at 5:40, leaving at 8:15. He is back at 8:40 and goes into the box but flies off 10 minutes later. Returning at 11:20, he sits on the ledge until 11:40, is back after 30 minutes but only stays for 10 minutes. He flies in again at 14:40, leaving after 20 minutes, returns at 15:50 but remaining for just 10 minutes. He flies in at dusk, 16:10 and appears to be in hunting mode taking short flights at 16:20 and 16:40. Another flight 5 minutes later is the final action of the day. 1 January – the male arrives at 5:40, leaving at 8:15. He is back at 8:40 and goes into the box but flies off 10 minutes later. Returning at 11:20, he sits on the ledge until 11:40, is back after 30 minutes but only stays for 10 minutes. He flies in again at 14:40, leaving after 20 minutes, returns at 15:50 but remaining for just 10 minutes. He flies in at dusk, 16:10 and appears to be in hunting mode taking short flights at 16:20 and 16:40. Another flight 5 minutes later is the final action of the day.